Spring, but not really - still. At least the fishing is good! This week my wife and daughter are out of town giving me excuse to indulge in my favorite past time, Tenkara fishing! I think so far I made the most out of it, hitting the river three times since Thursday. Thursday after work I hooked-up with my friend & neighbor Will to fish some of the ponds at Chatfield. This was my first warm water Tenkara outing which proved to be quite different from fishing a river. First of all, how I am supposed to read the water if it is not moving? Where are the fish? Do I just cast blindly and hope for the best? Well, it turned out to be ok, but I am not sure it's my favorite thing. I caught some of those flat fish (they might have been a blue gill or something like that) before Will suggested to walk to the South Platte upstream of Chatfield Lake. There were trout for sure but rising out of reach for my Tenkara rod since I did not bring any waders or wading boots. However, I tried but no trout. My friend Will on the other hand (god bless him, he fished with power bait) caught a small rainbow! I was very excited, this is the first fish Will while out fishing with me. Saturday I was supposed to head out with my friend Lyle to 11 Mile Canyon, but the forecast was so bad that we cancelled the trip. Saturday morning came and I slept in for once 'till 9am (yes, that is sleeping-in if you have a 3yo). I woke up to snow on the ground. This is April 30 in Colorado (did I mention that it was 70F on Thursday?). Anyway, instead of rain and or snowfall, blue sky was showing off. I made a quick decision, packed and headed to Bear Creek. The forecast still called for some rain or snow, so I didn't want to drive too far. I can be cold and miserable close by. I got to my spot around 11am and the car thermometer showed an outside temperature of 39F. I bundled up and made my way to the river. It started slow, but eventually I started catching trout in the usual places. By the time I headed home around 6.30pm it was 42F (I guess it didn't get past 45F during the day and the cold breeze didn't help either - next time I go fish I bring my gloves!). It was one of those days that look like a perfect BWO day but with no BWO - cold, cloudy, gray. However, I was able to fool some trout into taking a CDC BWO dun on top - sometimes you just have to take a leap of faith even if you don't see any rising fish. 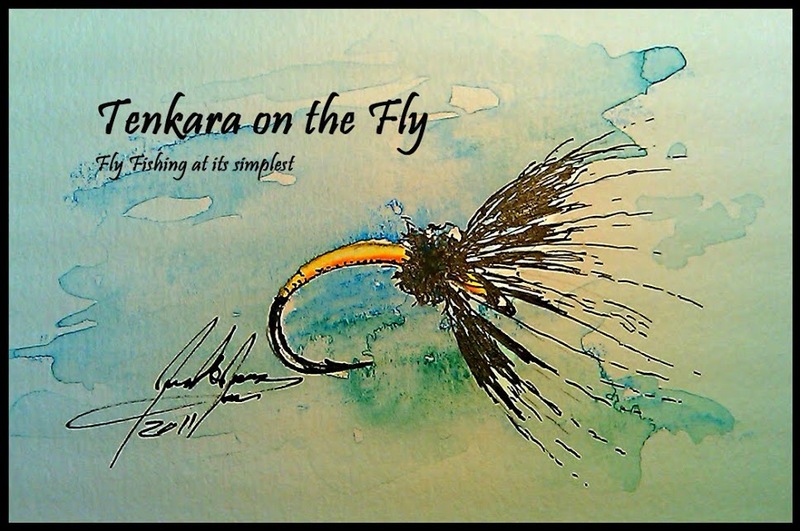 I started to get excited about the dry fly fishing prospects this year. Nothing better than an eager trout slamming your dry! Sunday I had plans to go fish with Graham, a friend from the Tenkara USA Forum. Initially, earlier in the week, we wanted to go up to the Ark to fish the mother's day caddis hatch but again, the weather plus some scheduling conflicts let us stay close to home. So, we fished, again, Bear Creek. We met at 9.30am, again 39F. Same weather as Saturday. Gray, cloudy, but less wind - and I forgot my gloves of course. I saw some snow showers further up the canyon but thankfully we stayed dry all day. Graham and I talked shop a lot, exchanged experiences and talked a lot of fishing BS. Fishing again started somewhat slow, but eventually the fish got interested in a Killer Kebari, both dead-drifted or twitched. We didn't catch just trout, we also caught our fair share of trees. I still have to figure out how to safely land a tree and release it unharmed. At the end of the day, on our way back from the plunge pools in the canyon, we started seeing splashes of rising fish. Quickly be both tied on a BWO but unfortunately with mixed success. We were able to bring some fish up but they either rolled or striked short until we found a nice long run where it looked like fish rising everywhere. I got myself into position and was able to land a few nice brown and a beautiful rainbow trout. A great way to end a good day. Braving the cold water and wind that equals painfully cold hands, I surveyed the underwater fauna. Amongst the usual suspects like beatis, caddis etc. I found a golden stone and some leeches (!). And some of the flat crawly clinger nymphs which I am not sure if those are March Browns or another mayfly.